You can get customer service from AT&T Wireless in two ways. You can call their customer service number or go to a device support center. If you want to speak to a person right away, you may want to use the ATT wireless customer service number listed below, rather than using the link. Call this number specifically to resolve your issues with your GoPhone prepaid AT&T cell phone. This number connects directly with a AT&T representative. The representative asks for the phone number you are inquiring about and assists you from there. You are NOT transferred, put on hold or disconnected. The representative handles your situation. For example, the last time I called ATT customer service at this number, I listened to a brief greeting that mentioned that prices may be lower online. Then I was told that all customer service representatives were busy and told that my expected wait time was three minutes. Then the music started playing. One advantage of getting a GoPhone is that AT&T is large enough to provide a physical address where you can go to try and resolve your problems. 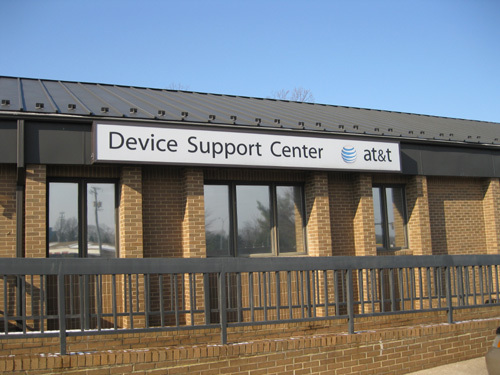 In this case, you can go one of the few AT&T Device Support Centers in the U.S.
For example, this unassuming building houses the AT&T Device Support Center in Woodbridge, VA.
No Cash. Only Credit or Debit Cards Accepted. If what’s wrong with your phone is not covered by your warranty, note that they do not accept cash, only credit and debit cards. The support center in New York is reputed to be quite busy, which is not surprising, but I didn’t see much of a crowd in the Woodbridge location. In any case, having more than one option for ATT wireless customer support, calling and going to a support center, is a good thing. If you wondered if customer service is any better at other companies . . .
You check this write-up about Tracfone's customer service. It's a mixed bag. If you're looking for a company where the customer service is based in North America, you can try GreatCall which produces the Jitterbug phone.